A critical transition in neuron development is formation of the axon, which establishes the polarized structure of the neuron that underlies its entire input and output capabilities. The morphological events that occur during axonogenesis have long been known, yet the molecular determinants underlying axonogenesis remain poorly understood. Anthony A. Oliva Jr et all demonstrate that axonogenesis requires activated c-Jun N-terminal kinase (JNK). JNK is expressed throughout the neuron, but its phosphorylated, activated form is highly enriched in the axon. In young axons, activated JNK forms a proximodistal gradient of increasing intensity, beginning at about the point where the axon exceeds the lengths of the other minor processes. Nearly every aspect of neuronal signaling depends on the development and maintenance of neuronal polarity (Craig and Banker, 1994). Neuronal polarity develops in a highly stereotypical manner: after initially forming a flattened, perisomatic lamellipodium (developmental stage 1 ), the neurons extend several short neurites (minor processes) that appear identical with respect to their morphology and molecular composition ( stage 2 ). The first evidence of polarity occurs when one neurite undergoes an extended period of growth,becoming the axon ( stage 3 ). Subsequently, the remaining neurites become dendrites ( stage 4 ). The transition from stage 2 to stage 3 (axonogenesis) is a defining event in establishing the highly polarized structure of the neuron. JNK is a stress-activated protein kinase. JNK is implicated in the development of cerebellar granule neurons (Bjo¨rkblom et al., 2005). JNK is implicated in regulating the transcriptional events that regulate neurite outgrowth in Purkinje cells (Kita et al., 1998) and axon regeneration in dorsal root ganglion neurons (Kenney and Kocsis, 1998). But recently, scientists have discovered a new and unexpected role for JNK in regulating the development of neuronal polarity: phospho-JNK is selectively enriched in both nascent and mature axons. Immunofluorescence microscopy using a plasmid encoding YFP, reveals that phospho-JNK is preferentially enriched in the axons of mature (stage 4) cultured hippocampal neurons (FIG A). At developmental stage 3, shortly after axon formation, phospho-JNK is already enriched in the axon, where it is expressed in a distally directed gradient of increasing intensity, extending into the growth cone (FIG B). The axonal enrichment of phospho-JNK begin where the axon surpassed the length of the minor processes: this correlates well to the axon “critical length”, which is the length that a neurite must surpass before it unequivocally can be identified as an axon (Esch et al., 1999), as well as the shortest length that the axon can be severed at (axotomized) and still retain its identity as an axon (Dotti and Banker, 1987). In contrast to phospho-JNK, total JNK (independent of phosphorylation state) has a more uniform distribution throughout all neurites (FIG D and FIG E). In most stage 2 neurons, phospho-JNK is absent from neurites (FIG F). However, in 3% of stage 2 neurons, phospho-JNK is enriched in the distal shaft and growth cone of a single neurite (FIG G). This suggests that JNK activation may be an early event during axonogenesis. 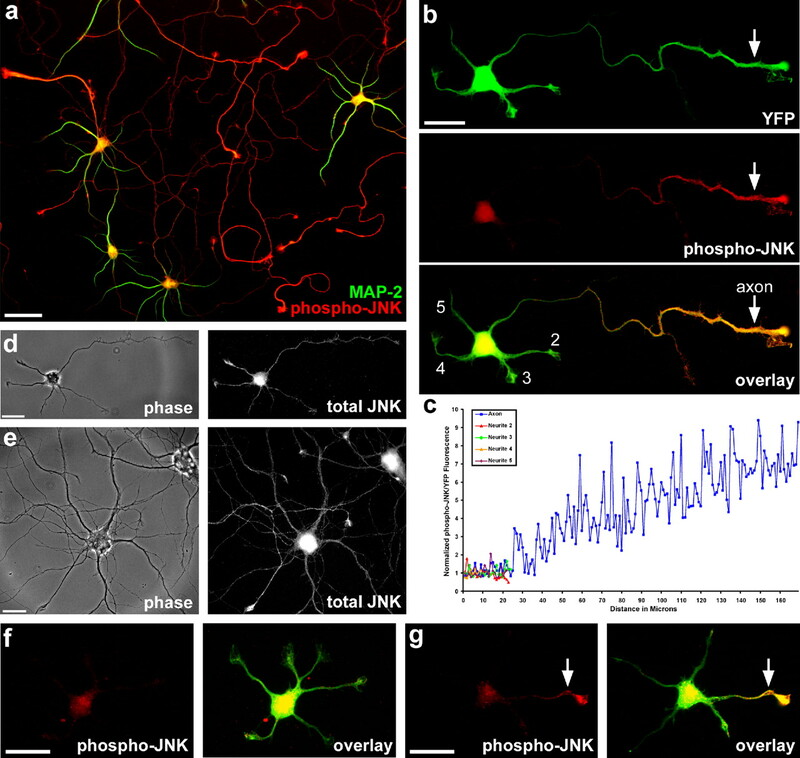 The enrichment of phospho-JNK in developing axons has been demonstrated, then it’s important to investigate whether activated JNK is required for axonogenesis. Using a reversible inhibitor of JNK, axonogenesis is eliminated but not the formation of minor neurites. This means that inhibition of JNK did not suppress neurites growth, but rather selectively inhibited axon outgrowth. If inhibitor is removed axonogenesis can proceed. JNK phosphorylates a variety of nuclear and cytoplasmic targets, including transcription factors, microtubule associated proteins, and proteins that interact with the actin cytoskeleton. Regulation of the microtubule and actin cytoskeletons plays an integral role in channeling growth to the emerging axon, the defining event in the specification of neuronal polarity. Target of JNK is ATF-2, a member of the ATF/CREB (cAMP response element-binding protein) family of transcription factors that bind to CRE (cAMP-responsive element) consensus sites and regulate numerous neuronal genes (Herdegen and Leah, 1998). Phospho-ATF-2 was found to be enriched in the axon, similar to the enrichment of phospho-JNK. Chronic or acute treatment with inhibitor decreased phospho-ATF-2, but did not significantly affect total ATF-2 levels.Thus, JNK is uniquely placed to regulate axonal growth directly, via its effects on the cytoskeleton, and over the long term, by regulating transcription.